Objective- The learner will be able to use shape to draw crayons and understand the importance of working as a team. 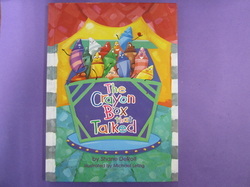 Procedure- Read the book The Crayon Box that Talked by Shane DeRolf. Discuss how the crayons did not get along at first, but when they worked together they were able to create a beautiful work of art. Model how to draw the crayons using rectangles and triangles. Have students color the crayons with crayon.